The father-son relationship between Sahara Natsuki (Sato Takeru) and Shimao Akimura (Watabe Atsuro) is not good, since Sahara Natsuki thinks his father abandoned him and his mother, when he was young. As destiny wants it, Sahara Natsuki was finally hired at Ginza police station as a detective, and there he finds out his partner is his father. Now they have to work together to solve crimes and solve the mystery behind Shimao Akimura, previous partner who was killed brutally. What can I say, when it comes to comedy Japan know the deal, I was laughing from the beginning to end. Sometimes they really overdid it, like police officers who don’t even know how to spell, they were just fooling around, but hey, that’s humor for some people so it’s not a minus. The relationship between the father and son, was just perfect! They didn’t hate each other nor did they show too much affection, they cared for each other in their own way, and that made the whole drama enjoyable, somehow it worked out to fit the whole concept. It was an interesting drama and definitely one you should give a chance. I am now a big fan of Sato Takeru (Tihihi). It took me a while to finish this drama, not because it’s bad, just because it wasn’t as good as these dramas can be. It has a bit too much slapstick, and kind of is on the borderline of ridiculous, which I really need to be in the mood to like. And as a police/crime drama I felt that there should be more investigation, rather than comedy. I know that the main is the son-father relationship and that, but what I love about police dramas is the actual police work. Putting that aside, the acting was great; I really love the way the acting is conveyed on the screen, and how natural it seems (excluding the slapstick). 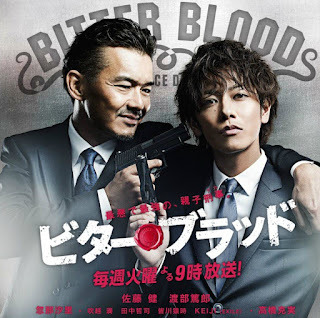 Sato Ryuta is a great actor and just gets better with time – I remembered him from Bloody Monday and was so thrilled to see him grow. And I love Shiori, as simple as that. Okay summing up: a good and funny drama, but they exaggerate it a bit.